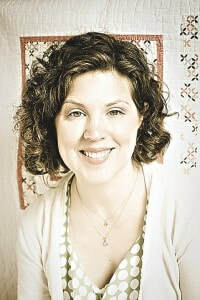 Amanda (Mandy) Leins is an author, award-winning quilter and teacher with experience quilting and designing for domestic and industrial machines. Visiting from Wilton, NY, she serves as a Bernina Ambassador, is a Craftsy instructor and has taught at Road to California. Her book, Wanderlust Quilts: 10 Modern Projects Inspired by Classic Art & Architecture, lets you travel the world without leaving your studio! Tour famous cities throughout the world by way of 10 modern quilts designed from classical art and architecture. This book is the foundation for her Saturday workshop -- Abstract Quilt from a Photo. In addition to her expertise in designing quilts, she is also known for her skill as a quilter using ruler work and free motion quilting techniques. ​Mandy will be presenting a lecture and trunk show discussing how ancient art and architecture, archaeology and modern quilts all work together. In this lecture, she will share how classical design principles can be tracked from the ancient world through to the Renaissance and on to Modern Art and architecture. There will be a Q&A session. She will also have books, patterns and small items available for purchase and signature. Guest s are welcome to attend our quarterly meetings; there is a $10 charge payable at the door.